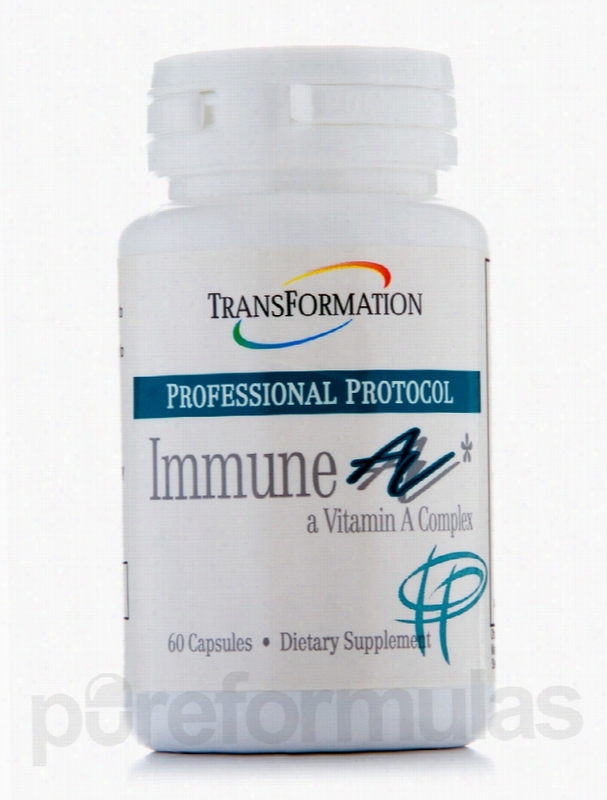 Transformation Enzyme Corporation Immune Support - Immune AV - 60. Looking for immune system supplements? Immune AV from Transformation Enzyme Corporation is formulated with essential vitamins&sbquo; botanicals&sbquo; minerals&sbquo; and enzymes that may offer the immune system support you're looking for. As an immune system supplement&sbquo; Immune AV features the essential vitamin A. In addition to playing a large role in ocular health&sbquo; vitamin A may also be integral for boosting and maintaining a healthy immune system. Immune AV also contains vitamin C&sbquo; an essential vitamin for all immune system supplements due to its possible potential for boosting and sustaining immune function. These dietary supplements also feature the essential mineral zinc. Used for years to possibly combat cold symptoms&sbquo; zinc has been an reoccurring component in many immune system supplements. Other essential minerals featured in Immune AV are selenium and copper. Astragalus root is another featured ingredient in this immune system supplement. Used for years in traditional medicines&sbquo; this plant is believed by some to possibly boost and sustain healthy immune system function. Similarly&sbquo; Immune AV also features licorice root and pau d'Arco bark&sbquo; two botanicals that may help promote healthy immune system function. Amino acids are the essential building components of proteins. Our bodies can't synthesize them naturally&sbquo; so we really on dietary supplements and food in order to get them. One such amino acid is featured in these immune system supplements. L-lysine HCI&sbquo; has been used in immune system supplements due to the fact that it may possibly help prevent certain infections from appearing in our body. Immune AV also features Tzyme&trade; Enzyme Blend&sbquo; a diverse blend of enzymes formulated to possibly help the metabolic processes required for nutrient absorption. Since its founding in 1991&sbquo; Transformation Enzyme Corporation (TEC) has believed that you should be able to enjoy a healthy and happy lifestyle. Since then&sbquo; TEC has been providing nutritional supplements that allow people around the world to maintain their health in the most convenient way possible. These statements have not been evaluated by the Food and Drug Administration (FDA). These products are not meant to diagnoseÃ¢ÂÂ treat or cure any disease or medical condition. Please consult your doctor before starting any exercise or nutritional supplement program or before using these or any product during pregnancy or if you have a serious medical condition. 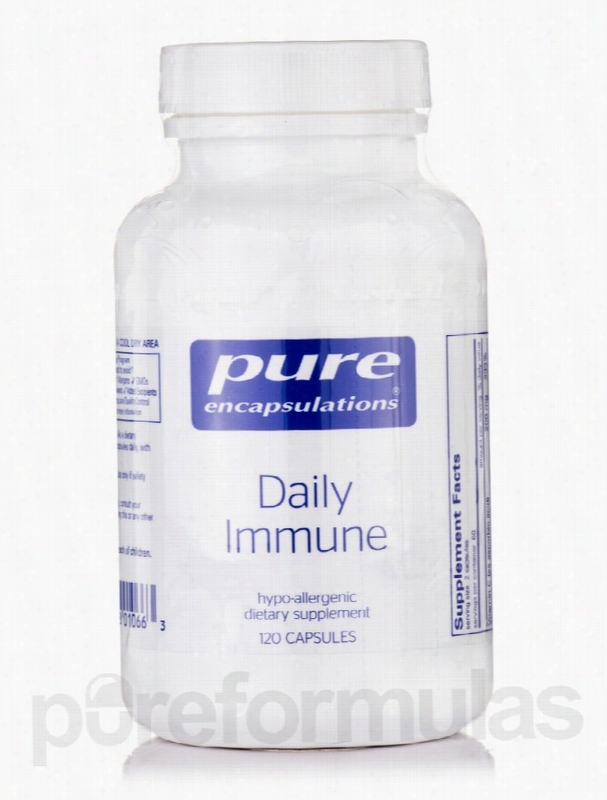 Pure Encapsulations Immune Support - Daily Immune - 120 Capsules. Unfortunately, PureFormulas is not allowed to sell/ship this brand to international destinations. Are you looking for a supplement that provides immunity-boosting herbs and nutrients in a convenient capsule? Pure Encapsulations' Daily Immune contains zinc&sbquo; bioflavonoids&sbquo; polyphenols&sbquo; adaptogens&sbquo; and polysaccharides to support your immune system&sbquo; as well as your complete well-being. Immune cells such as macrophages and lymphocytes have vitamin D receptors&sbquo; meaning that this vitamin may be able to activate these immune cells that can protect you from feeling sick. Meanwhile&sbquo; maitake mushroom&sbquo; aloe vera&sbquo; and arabinogalactan (from the Larch tree) provide polysaccharides. Polysaccharides may promote the healthy functioning of immune mediators&sbquo; in addition to supporting the health of these immune cells. Hesperidin can work to maintain the proper release of histamine. Histamine is involved in immune and inflammatory responses&sbquo; and may contribute to inconvenient allergy symptoms like sneezing or a runny nose. Lemon balm extract and elderberry provide polyphenols&sbquo; anthocyanins&sbquo; and flavonoids that have potential antioxidant properties to help protect the cells of you immune system. Zinc is a trace mineral that can give you additional immune support and manage inflammation by helping your T-cells function&sbquo; while citrus bioflavonoids (from oranges&sbquo; lemons&sbquo; tangerines&sbquo; grapefruits&sbquo; and limes) may also serve as antioxidants that may neutralize potentially harmful free radicals when combined with vitamin C. Finally&sbquo; eleuthero and astragalus may serve as adaptogenic herbs. As a result&sbquo; they may be able to help your immune system-as well as the rest of your body-cope with occasional stress. Both physical and mental stressors can lower your immune defenses without this support. Take two capsules daily with meals. At the recommended dosage&sbquo; each 120-capsule bottle of Daily Immune by Pure Encapsulations should last for about two months. Pure Encapsulations seeks to formulate and manufacture high-quality&sbquo; hypoallergenic dietary supplements. Quality control during the formulation and manufacturing process is paramount. All Pure Encapsulations Products are made with the most bioavailable ingredients possible. These statements have not been evaluated by the Food and Drug Administration (FDA). These products are not meant to diagnoseÃ¢ÂÂ treat or cure any disease or medical condition. Please consult your doctor before starting any exercise or nutritional supplement program or before using these or any product during pregnancy or if you have a serious medical condition. 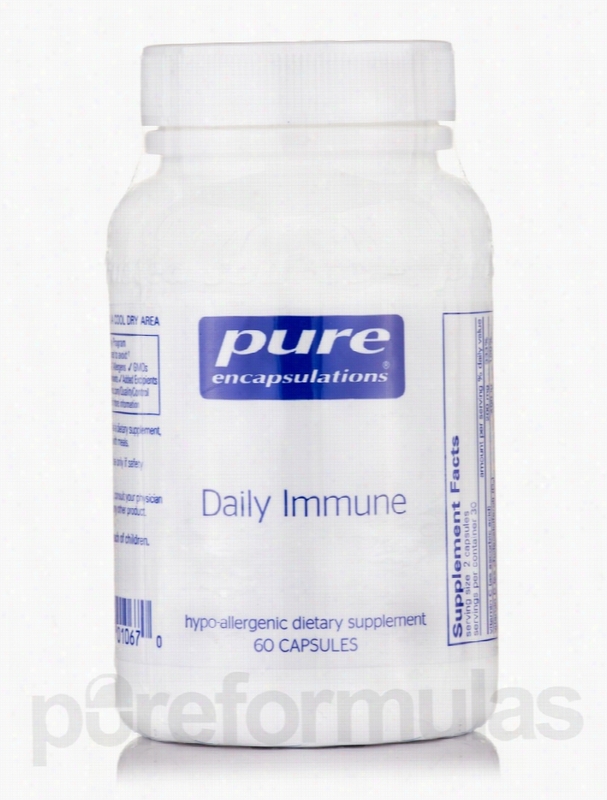 Pure Encapsulations Immune Support - Daily Immune - 60 Capsules. Unfortunately, PureFormulas is not allowed to sell/ship this brand to international destinations. Your immune system requires nutritional support in order to stay strong and protect you from getting sick by fighting off germs or other invaders. Daily Immune by Pure Encapsulations provides a wide array of nutrients in order to support immune health and functioning. For example&sbquo; vitamin D3 can help activate immune cells because the macrophages and lymphocytes have vitamin D receptors. Meanwhile&sbquo; vitamin C and zinc also support immunity&sbquo; as do several bioflavonoids. The citrus bioflavonoids in Daily Immune have antioxidant properties that can protect your cells by neutralizing potentially harmful free radicals. Hesperidin is another bioflavonoid that helps maintain healthy levels of histamine release. The bioflavonoids in this supplement come from grapefruit&sbquo; lemon&sbquo; lime&sbquo; tangerine&sbquo; and orange. While citrus bioflavonoids aren't strictly essential&sbquo; they may help improve your health and overall quality of life. In addition to vitamins and Minerals&sbquo; every capsule of Daily Immune also contains herbs and botanicals to give your immune system further support. Lemon balm extract and elderberry provide polyphenols and anthocyanins that may enhance immunity&sbquo; while arabinogalactan (Larix spp)&sbquo; maitake mushroom&sbquo; and aloe vera can help immune cells and mediators function effectively. The aloe in this convenient supplement has been standardized to ensure that it contains 10 percent active polysaccharides. Finally&sbquo; eleuthero and astralagus may serve as adaptogens: these herbal extracts can help your body cope with physical and mental stress&sbquo; which would otherwise interfere with your immune system. Eleuthero has been standardized to contain 0.8 percent of the active compound eleutheroside E &amp; B. Take two capsules daily with meals. At the recommended dosage&sbquo; each 60-capsule bottle of Pure Encapsulations' Daily Immune should last for about two months. Pure Encapsulations seeks to formulate and manufacture high-quality&sbquo; hypoallergenic dietary supplements. Quality control during the formulation and manufacturing process is paramount. All Pure Encapsulations products are made with the most bioavailable ingredients possible. These statements have not been evaluated by the Food and Drug Administration (FDA). These products are not meant to diagnoseÃ¢ÂÂ treat or cure any disease or medical condition. Please consult your doctor before starting any exercise or nutritional supplement program or before using these or any product during pregnancy or if you have a serious medical condition. Pure Encapsulations Immune Support - Immune Support Liquid - 4 fl. oz. Unfortunately, PureFormulas is not allowed to sell/ship this brand to international destinations. For a convenient way to maintain healthy immune system function&sbquo; try Immune Support Liquid by Pure Encapsulations. This supplement provides an array of herbs&sbquo; in addition to beta carotene and zinc. Arabinogalactan and Aloe vera are botanicals that may promote the effective functioning of your immune cells. They contain polysaccharides that might play a role in the activity of immune mediators. Meanwhile&sbquo; hesperidin is a flavonoid that could help maintain normal histamine release. As a result&sbquo; Immune Support Liquid may work to potentially alleviate mild allergic symptoms like sneezing or a runny nose. Finally&sbquo; lemon balm and elderberry extracts contain anthocyanins that may have antioxidant properties. Antioxidants strive to protect cells throughout your body from free radicals. Since Immune Support Liquid is naturally sweetened with stevia&sbquo; this grape-flavored liquid supplement is great for adults and kids alike! Adults should take one or two teaspoons a day with a meal&sbquo; while the dosage for children over the age of four varies depending on their age. 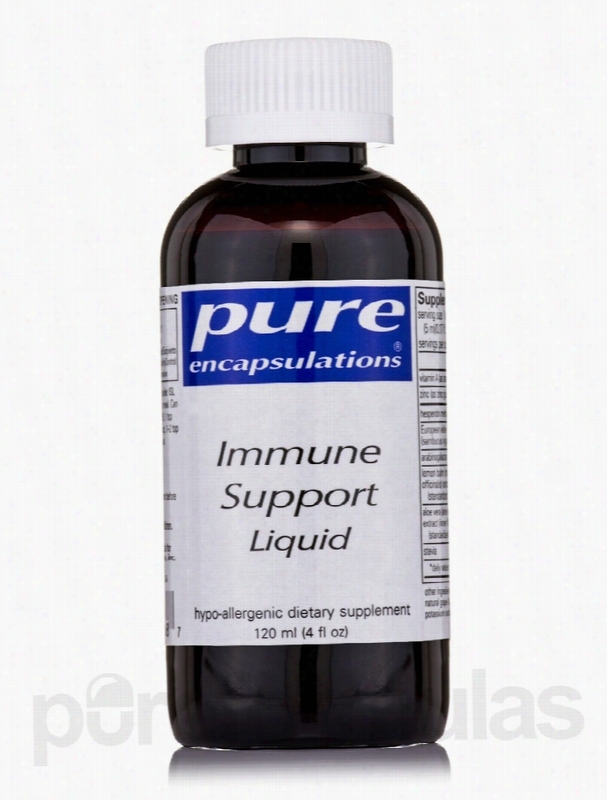 One bottle of Pure Encapsulations&rsquo; Immune Support Liquid contains four ounces of solution. These statements have not been evaluated by the Food and Drug Administration (FDA). These products are not meant to diagnoseÃ¢ÂÂ treat or cure any disease or medical condition. Please consult your doctor before starting any exercise or nutritional supplement program or before using these or any product during pregnancy or if you have a serious medical condition. NOW Immune Support - Immune Renew - 90 Vegetarian Capsules. 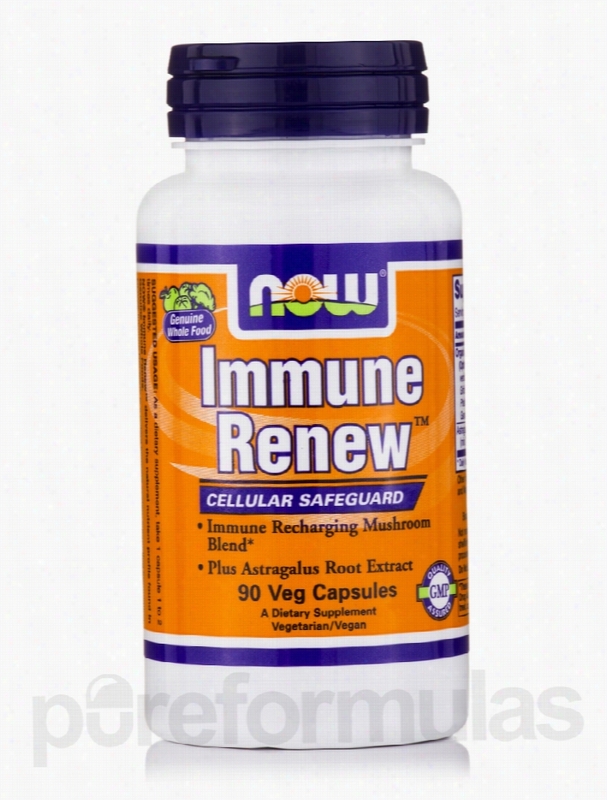 Cellular Safeguard!NOW&reg; Immune Renew&trade; is a healthy immune system supporting formulation containing Standardized Astragalus Extract and a High Beta-Glucan Proprietary Mushroom Blend. Astragalus has been shown in non-clinical studies to support a number of aspects of healthy immune function&sbquo; including the enhancement of T-Cell and Natural Killer Cell activity. Natural killer cells are so named because they destroy unhealthy cells in the body virtually on contact. NOW's Proprietary Blend of eight organic mushrooms provides additional healthy immune support due to its high 1&sbquo;3 Beta Glucan content. 1&sbquo;3 Beta Glucans are especially valuable to healthy immune system response&sbquo; though they're increasingly lacking in today's typical diet. Scientific studies have demonstrated that the 1&sbquo;3 form of Beta Glucan found in mushrooms possesses remarkable abilities to support both innate and adaptive healthy immune function. A healthy immune system is the foundation of good health. Use NOW&reg; Immune Renew&trade; to help support healthy immune function throughout the year. These statements have not been evaluated by the Food and Drug Administration (FDA). These products are not meant to diagnoseÃ¢ÂÂ treat or cure any disease or medical condition. Please consult your doctor before starting any exercise or nutritional supplement program or before using these or any product during pregnancy or if you have a serious medical condition. Integrative Therapeutics Immune Support - Pro-Flora Immune with. Protecting your immune system is vital if you want to live a long and healthy life. If your immune system is weak&sbquo; it's unable to effectively protect your body from viruses and other harmful invaders. You can boost immunity through several methods&sbquo; and your diet plays an important part in the process. For example&sbquo; foods such as oranges&sbquo; strawberries&sbquo; and grapefruit are all high in vitamin C&sbquo; which is known to support the immune system. However&sbquo; you may not be eating enough of these foods on a daily basis; maybe they&rsquo;re hard to find year-round&sbquo; too expensive&sbquo; or just don&rsquo;t like the taste. Fortunately&sbquo; a convenient supplement can provide you with the vitamin C your body needs. 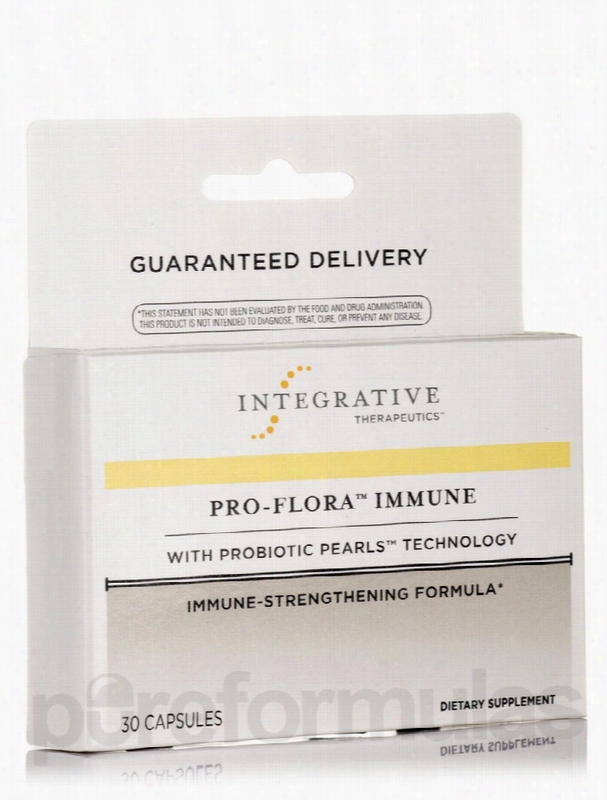 Pro-Flora Immune with Probiotic Pearls by Integrative Therapeutics can improve your immune system&sbquo; as well as your overall health. These capsules have many health benefits&sbquo; including potential to assist with healthy cell growth in the colon&sbquo; and ability to enhance microflora balance in the gut. Each capsule contains ingredients and probiotics like: Plantarum&sbquo; which is a good bacteria that helps your body digest food&sbquo; boost immunity&sbquo; and absorb nutrients Acidophilus&sbquo; a bacteria that has many health benefits including reducing the symptoms of irritable bowel syndrome (IBS)&sbquo; fighting off yeast infections&sbquo; and reducing discomfort caused by urinary tract infections (UTIs) Lactoferrin&sbquo; which is a protein that may alleviate uncomfortable intestinal ulcers and diarrhea Take one capsule of Integrative Therapeutics&rsquo; Pro-Flora Immune with Probiotic Pearls once daily&sbquo; either with or without food. One bottle of Pro-Flora Immune with Probiotic Pearls should last for about one month if you take the recommended dosage. Integrative Therapeutics has been providing high-quality Nutritional supplements to health care professionals for over 35 years. Its products have been tested in thousands of clinical studies&sbquo; and are proudly manufactured in a GMP-audited facility. The manufacturing processes of Integrative Therapeutics meet or exceed all industry standards. These statements have not been evaluated by the Food and Drug Administration (FDA). These products are not meant to diagnoseÃ¢ÂÂ treat or cure any disease or medical condition. Please consult your doctor before starting any exercise or nutritional supplement program or before using these or any product during pregnancy or if you have a serious medical condition. 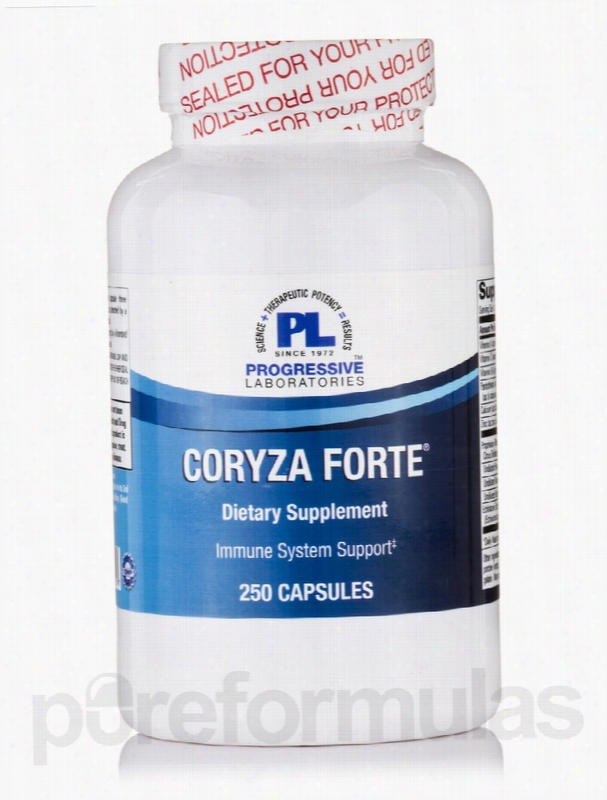 Progressive Labs Immune Support - Coryza Forte - 250 Capsules. Support your immune system with Coryza Forte&sbquo; immune system supplements formulated with vitamins&sbquo; minerals&sbquo; and botanicals to possibly aid and improve your immune health. Vitamin A This Essential vitamin plays a role in several bodily functions such as treating vitamin A deficiency&sbquo; possible regulation of menstrual symptoms&sbquo; improved vision&sbquo; and certain gastrointestinal conditions. But Progressive Labs formulated Coryza Forte with vitamin A supplements because it can possibly support a healthy immune system. A recent study has suggested that vitamin A has a hand in pro- and anti-inflammatory immune responses within the gastrointestinal tract. Echinacea Angustifolia root This botanical has been used for years to possibly treat certain viruses and bolster immune function. Research and studies conducted suggests that echinacea angustifola root might interact and affect specific chemicals that decrease inflammation&sbquo; which would then lessen the severity of some cold and flu symptoms. Zinc As an essential mineral&sbquo; zinc supports many health related functions in our body. But most important for Progressive Labs' immune system supplement is zinc's possible immune boosting ability&sbquo; alleviating symptoms of the common cold. Zinc has also been implicated in aiding the body in wound healing. Calcium Very recent studies have suggested that calcium is responsible for our immune system's first response to repairing tissue. Research postulates that once tissue is broken&sbquo; calcium is quickly flashed on the site&sbquo; activating an enzyme that creates hydrogen peroxide. This chemical attracts first responding white blood cells to the site. This initial wave of white blood cells is responsible for killing any pathogens that may have invaded the body through damaged tissue. Progressive Labs' immune system supplement also features vitamin C&sbquo; patothenic acid&sbquo; and a proprietary blend formulated to possibly support immune health. Progressive Labs has been a family owned manufacturer and distributor of nutritional supplements for 40 years. Progressive Labs has supplied over 25&sbquo;000 customers with professional grade vitamins&sbquo; herbals&sbquo; and dietary supplements. These statements have not been evaluated by the Food and Drug Administration (FDA). These products are not meant to diagnoseÃ¢ÂÂ treat or cure any disease or medical condition. Please consult your doctor before starting any exercise or nutritional supplement program or before using these or any product during pregnancy or if you have a serious medical condition. 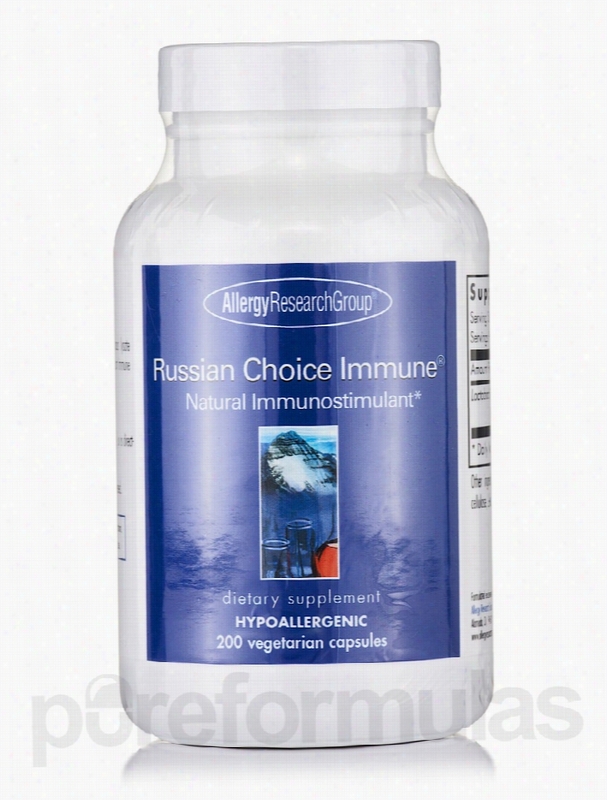 Allergy Research Group Immune Support - Russian Choice Immune - 200. If you&rsquo;re looking for a convenient way to maintain healthy immune function&sbquo; you might want to try Allergy Research Group&rsquo;s Russian Choice Immune&reg; Capsules. This supplement is identical to Russian Choice Immune&reg; Powder&sbquo; except for the fact that it's in a more convenient pill form. Every three-capsule serving of Russian Choice Immune&reg; contains 75 milligrams of Lactobacillus rhamnosus lysate powder&sbquo; which is comprised of cell wall fragments from Lactobacillus rhamnosus (a form of probiotic bacteria). Like other probiotics&sbquo; Lactobacillus rhamnosus may work to support the mucosal immune system. The mucosal immune system is located in your gut and serves as your cells&rsquo; first line of defense against many of the antigens that could cause you to feel sick. In particular&sbquo; lactobacillus contains special peptides that can activate cytokines&sbquo; which are cells that help your immune cells communicate with each other. As a result&sbquo; Russian Choice Immune&reg; may work to stimulate immune response; with this in mind&sbquo; it may help address certain symptoms associated with mild infections. Take one to three capsules once or twice daily. At the recommended dosage&sbquo; each 200-capsule bottle of Russian Choice Immune&reg; by Allergy Research Group should last for about one to six months. These statements have not been evaluated by the Food and Drug Administration (FDA). These products are not meant to diagnoseÃ¢ÂÂ treat or cure any disease or medical condition. Please consult your doctor before starting any exercise or nutritional supplement program or before using these or any product during pregnancy or if you have a serious medical condition. Nature's Way Immune Support - Sambucus Immune Syrup - 8 fl. oz (240. 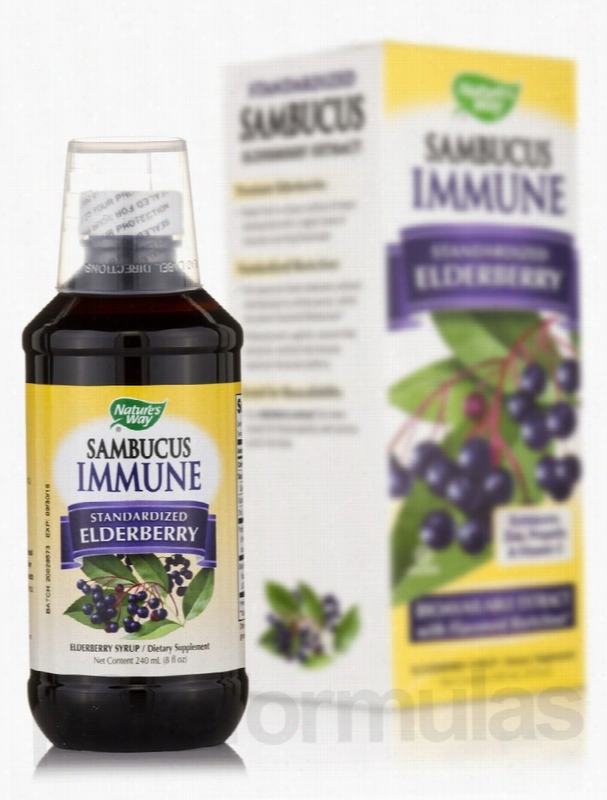 Sambucus Immune Syrup - 8 fl. oz (240 ml) from Nature's Way&reg; contains the black elderberry extract that may boost immune health&sbquo; especially during the winter season. Studies reveal that the presence of sunlight is crucial for immune health. However&sbquo; sunlight exposure is minimum during winters&sbquo; which could lead to a decline in immune system function. Immune health is extremely crucial to safeguard the body from external virus and bacteria&sbquo; lack of which may cause health conditions. This syrup from Nature's Way&reg; contains elderberry extract that could boost immune health in children and adults&sbquo; especially during winters. Sambucus or elderberry is a plant that could affect the immune system. Elderberry may also potentially reduce inflammation. This plant is also commonly used as a laxative for constipation&sbquo; to increase urine output&sbquo; and to cause sweating. This syrup contains a Standardized&sbquo; Bio-Certified extract with higher naturally occurring levels of BioActives&reg; constituents for optimal impact. This product is free from artificial colors&sbquo; flavors or preservatives and Gluten. Get Kosher certified Sambucus Immune Syrup - 8 fl. oz. (240 ml) from Nature's Way&reg; that may stimulate immune health. These statements have not been evaluated by the Food and Drug Administration (FDA). These products are not meant to diagnoseÃ¢ÂÂ treat or cure any disease or medical condition. Please consult your doctor before starting any exercise or nutritional supplement program or before using these or any product during pregnancy or if you have a serious medical condition. 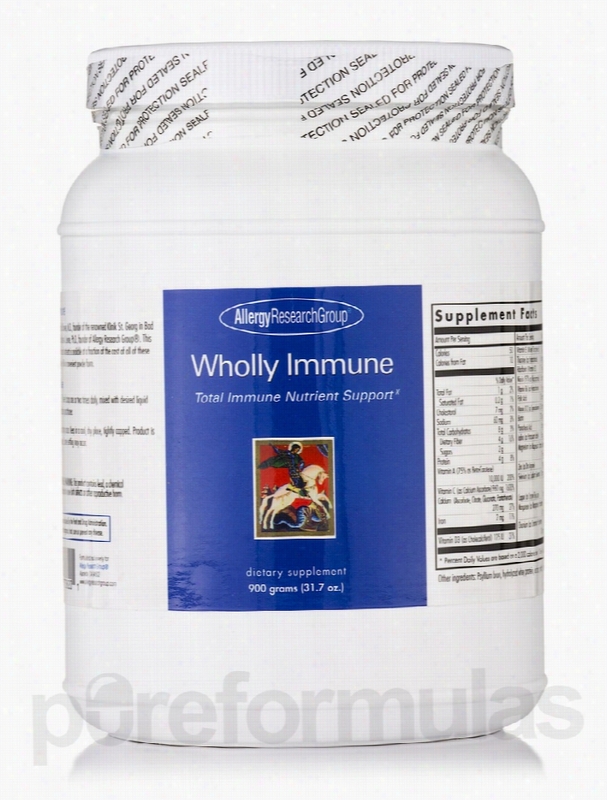 Allergy Research Group Cellular Support - Wholly Immune Powder - 31.7. Wholly Immune Powder by Allergy Research Group provides a wide array of nutrients that may help address certain symptoms associated with a weakened immune system. These nutrients include vitamin C and zinc&sbquo; both of which may work to reduce the duration and severity of certain symptoms associated with the common cold. This powdered supplement may also have a mild detoxifying effect because it contains nutrients and herbs like milk thistle extract. Milk thistle extract contains a compound called silymarin that may work to promote healthy liver function&sbquo; which is important because your liver works to remove potentially harmful toxins from your body. Finally&sbquo; many of the ingredients in Wholly Immune Powder&mdash;such as vitamin A (beta carotene) and CoQ10&mdash;can serve as antioxidants. Antioxidants may act to protect cells throughout your body from free radical damage. Mix one scoop of Wholly Immune Powder with two to three ounces of juice or soy milk. At the recommended serving size&sbquo; each 900-gram container of Allergy Research Group&rsquo;s Wholly Immune Powder should last for about three to six weeks. These statements have not been evaluated by the Food and Drug Administration (FDA). These products are not meant to diagnoseÃ¢ÂÂ treat or cure any disease or medical condition. Please consult your doctor before starting any exercise or nutritional supplement program or before using these or any product during pregnancy or if you have a serious medical condition.